Following the discovery, in 1911, by Ernest Rutherford of the atomic nucleus, it was proposed that the integer count of the nuclear charge is identical to the sequential place of each element in the periodic table. In 1913, Henry Moseley using X-ray spectroscopy confirmed this proposal experimentally. Moseley determined the value of the nuclear charge of each element and showed that Mendeleev's ordering actually places the elements in sequential order by nuclear charge. Nuclear charge is identical to proton count and determines the value of the atomic number (Z) of each element. Using atomic number gives a definitive, integer-based sequence for the elements. 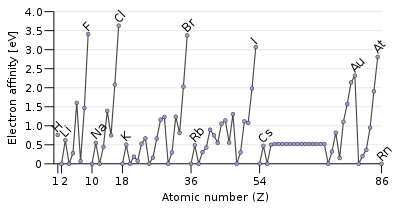 Moseley predicted, in 1913, that the only elements still missing between aluminium (Z = 13) and gold (Z = 79) were Z = 43, 61, 72, and 75, all of which were later discovered. The atomic number is the absolute definition of an element and gives a factual basis for the ordering of the periodic table. 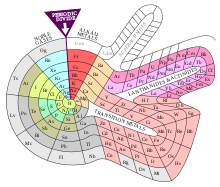 In other words, since the atomic number of an element is the same as the number of protons in its nucleus, the modern periodic table arranges the elements according to their atomic number, and relative to their atomic mass, the way Mendeleev did. The periodic table is used to predict the properties of new synthetic elements before they are produced and studied. Hydrogen's chemical properties are not very close to those of the alkali metals, which occupy group 1. On this basis it is sometimes placed elsewhere. A common alternative is at the top of group 17 given hydrogen's strictly univalent and largely non-metallic chemistry, and the strictly univalent and non-metallic chemistry of fluorine (the element otherwise at the top of group 17). Sometimes, to show hydrogen has properties corresponding to both those of the alkali metals and the halogens, it is shown at the top of the two columns simultaneously. Another suggestion is above carbon in group 14: placed that way, it fits well into the trends of increasing ionization potential values and electron affinity values, and is not too far from the electronegativity trend, even though hydrogen cannot show the tetravalence characteristic of the heavier group 14 elements. Finally, hydrogen is sometimes placed separately from any group; this is based on its general properties being different from those of the elements in any other group. The other period 1 element, helium, is sometimes placed separately from any group as well. The property that distinguishes helium from the rest of the noble gases (even though the extraordinary inertness of helium is extremely close to that of neon and argon) is that in its closed electron shell, helium has only two electrons in the outermost electron orbital, while the rest of the noble gases have eight. Although scandium and yttrium are always the first two elements in group 3, the identity of the next two elements is not completely settled. They are commonly lanthanum and actinium, and less often lutetium and lawrencium. 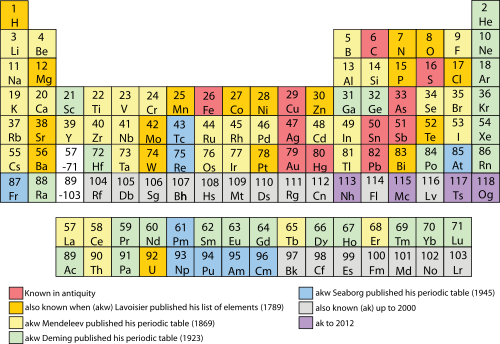 The two variants originate from historical difficulties in placing the lanthanides in the periodic table, and arguments as to where the f block elements start and end. [n 10][n 11] It has been claimed that such arguments are proof that, "it is a mistake to break the [periodic] system into sharply delimited blocks". A third variant shows the two positions below yttrium as being occupied by the lanthanides and the actinides. ↑ A second extra-long periodic table row, to accommodate known and undiscovered elements with an atomic weight greater than bismuth (thorium, protactinium and uranium, for example), had been postulated as far back as 1892. Most investigators considered that these elements were analogues of the third series transition elements, hafnium, tantalum and tungsten. The existence of a second inner transition series, in the form of the actinides, was not accepted until similarities with the electron structures of the lanthanides had been established. See: van Spronsen, J. W. (1969). The periodic system of chemical elements. Amsterdam: Elsevier. p. 315–316, ISBN 0-444-40776-6. ↑ "Chemistry: Four elements added to periodic table". BBC News. 4 January 2016. Archived from the original on 4 January 2016. ↑ St. Fleur, Nicholas (1 December 2016). "Four New Names Officially Added to the Periodic Table of Elements". New York Times. Archived from the original on 14 August 2017. 1 2 3 4 5 6 Emsley, J. (2011). Nature's Building Blocks: An A-Z Guide to the Elements (New ed.). New York, NY: Oxford University Press. ISBN 978-0-19-960563-7. ↑ CNN, Ashley Strickland. "New elements on the periodic table are named". CNN. Archived from the original on 10 June 2016. Retrieved 11 June 2016. ↑ "Discovery and assignment of elements with atomic numbers 113, 115, 117 and 118". International Union of Pure and Applied Chemistry. 30 December 2015. Archived from the original on 13 June 2016. ↑ "Hello, Nihonium. Scientists Name 4 New Elements On The Periodic Table". NPR.org. Archived from the original on 10 June 2016. Retrieved 11 June 2016. ↑ Koppenol, W. H. (2002). "Naming of New Elements (IUPAC Recommendations 2002)" (PDF). Pure and Applied Chemistry. 74 (5): 787–791. doi:10.1351/pac200274050787. Archived (PDF) from the original on 31 October 2008. ↑ Silva, Robert J. (2006). "Fermium, Mendelevium, Nobelium and Lawrencium". In Morss, L. R.; Edelstein, N. M.; Fuger, J. The Chemistry of the Actinide and Transactinide Elements (3rd ed.). Dordrecht, The Netherlands: Springer Science+Business Media. ISBN 978-1-4020-3555-5. ↑ Messler, R. W. (2010). The essence of materials for engineers. Sudbury, MA: Jones & Bartlett Publishers. p. 32. ISBN 978-0-7637-7833-0. ↑ Bagnall, K. W. (1967). "Recent advances in actinide and lanthanide chemistry". In Fields, P. R.; Moeller, T. Advances in chemistry, Lanthanide/Actinide chemistry. Advances in Chemistry. 71. American Chemical Society. pp. 1–12. doi:10.1021/ba-1967-0071. ISBN 978-0-8412-0072-2. ↑ Day, M. C., Jr.; Selbin, J. (1969). Theoretical inorganic chemistry (2nd ed.). New York: Nostrand-Rienhold Book Corporation. p. 103. ISBN 978-0-7637-7833-0. ↑ Holman, J.; Hill, G. C. (2000). Chemistry in context (5th ed.). Walton-on-Thames: Nelson Thornes. p. 40. ISBN 978-0-17-448276-5. 1 2 Connelly, N. G.; Damhus, T.; Hartshorn, R. M.; Hutton, A. T. (2005). Nomenclature of Inorganic Chemistry: IUPAC Recommendations 2005 (PDF). RSC Publishing. p. 51. ISBN 978-0-85404-438-2. ↑ Fluck, E. (1988). "New Notations in the Periodic Table" (PDF). Pure Appl. Chem. 60 (3): 431–436. doi:10.1351/pac198860030431. Archived (PDF) from the original on 25 March 2012. Retrieved 24 March 2012. ↑ "The constitution of group 3 of the periodic table". IUPAC. 2015-12-18. ↑ Stoker, S. H. (2007). General, organic, and biological chemistry. New York: Houghton Mifflin. p. 68. ISBN 978-0-618-73063-6. OCLC 52445586. ↑ Mascetta, J. (2003). Chemistry The Easy Way (4th ed.). New York: Hauppauge. p. 50. ISBN 978-0-7641-1978-1. OCLC 52047235. ↑ Kotz, J.; Treichel, P.; Townsend, John (2009). Chemistry and Chemical Reactivity, Volume 2 (7th ed.). Belmont: Thomson Brooks/Cole. p. 324. ISBN 978-0-495-38712-1. OCLC 220756597. ↑ Jones, C. (2002). d- and f-block chemistry. New York: J. Wiley & Sons. p. 2. ISBN 978-0-471-22476-1. OCLC 300468713. ↑ Silberberg, M. S. (2006). Chemistry: The molecular nature of matter and change (4th ed.). New York: McGraw-Hill. p. 536. ISBN 978-0-07-111658-9. ↑ Manson, S. S.; Halford, G. R. (2006). Fatigue and durability of structural materials. Materials Park, Ohio: ASM International. p. 376. ISBN 978-0-87170-825-0. ↑ Jones, B. W. (2010). Pluto: Sentinel of the outer solar system. Cambridge: Cambridge University Press. pp. 169–71. ISBN 978-0-521-19436-5. ↑ Hinrichs, G. D. (1869). "On the classification and the atomic weights of the so-called chemical elements, with particular reference to Stas's determinations". Proceedings of the American Association for the Advancement of Science. 18 (5): 112–124. Archived from the original on 2 August 2016. 1 2 Myers, R. (2003). The basics of chemistry. Westport, CT: Greenwood Publishing Group. pp. 61–67. ISBN 978-0-313-31664-7. 1 2 Chang, R. (2002). Chemistry (7 ed.). New York: McGraw-Hill. pp. 289–310, 340–42. ISBN 978-0-07-112072-2. 1 2 Jolly, W. L. (1991). Modern Inorganic Chemistry (2nd ed.). McGraw-Hill. p. 22. ISBN 978-0-07-112651-9. ↑ Pauling, L. (1932). "The Nature of the Chemical Bond. IV. The Energy of Single Bonds and the Relative Electronegativity of Atoms". Journal of the American Chemical Society. 54 (9): 3570–3582. Bibcode:1932JAChS..54.2610C. doi:10.1021/ja01348a011. ↑ Allred, A. L. (1960). "Electronegativity values from thermochemical data". Journal of Inorganic and Nuclear Chemistry. 17 (3–4): 215–221. doi:10.1016/0022-1902(61)80142-5. Retrieved 11 June 2012. ↑ Siekierski, S.; Burgess, J. (2002). Concise chemistry of the elements. Chichester: Horwood Publishing. pp. 35‒36. ISBN 978-1-898563-71-6. ↑ Yoder, C. H.; Suydam, F. H.; Snavely, F. A. (1975). Chemistry (2nd ed.). Harcourt Brace Jovanovich. p. 58. ISBN 978-0-15-506465-2. ↑ Sacks, O. (2009). Uncle Tungsten: Memories of a chemical boyhood. New York: Alfred A. Knopf. pp. 191, 194. ISBN 978-0-375-70404-8. 1 2 MacKay, K. M.; MacKay, R. A.; Henderson, W. (2002). Introduction to Modern Inorganic Chemistry (6th ed.). Cheltenham: Nelson Thornes. pp. 194–196. ISBN 978-0-7487-6420-4. ↑ Remy, H. (1956). 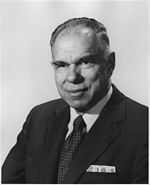 Kleinberg, J., ed. Treatise on Inorganic Chemistry. 2. Amsterdam: Elsevier. p. 30. ↑ King, R. B. (1995). Inorganic chemistry of main group elements. New York: Wiley-VCH. p. 289. ↑ Spedding, F. H.; Beadry, B. J. (1968). "Lutetium". In Hampel, C. A. The Encyclopedia of the Chemical Elements. Reinhold Book Corporation. pp. 374–378. ↑ Settouti, N.; Aourag, H. (2014). "A Study of the Physical and Mechanical Properties of Lutetium Compared with Those of Transition Metals: A Data Mining Approach". JOM. 67 (1): 87–93. Bibcode:2015JOM....67a..87S. doi:10.1007/s11837-014-1247-x. 1 2 Silva, Robert J. (2011). "Chapter 13. Fermium, Mendelevium, Nobelium, and Lawrencium". In Morss, Lester R.; Edelstein, Norman M.; Fuger, Jean. The Chemistry of the Actinide and Transactinide Elements. Netherlands: Springer. pp. 1621–1651. doi:10.1007/978-94-007-0211-0_13. ISBN 978-94-007-0210-3. ↑ Sato, T. K.; Asai, M.; Borschevsky, A.; Stora, T.; Sato, N.; Kaneya, Y.; Tsukada, K.; Düllman, Ch. E.; Eberhardt, K.; Eliav, E.; Ichikawa, S.; Kaldor, U.; Kratz, J. V.; Miyashita, S.; Nagame, Y.; Ooe, K.; Osa, A.; Renisch, D.; Runke, J.; Schädel, M.; Thörle-Pospiech, P.; Toyoshima, A.; Trautmann, N. (9 April 2015). "Measurement of the first ionization potential of lawrencium, element 103" (PDF). Nature. 520 (7546): 209–211. Bibcode:2015Natur.520..209S. doi:10.1038/nature14342. PMID 25855457. ↑ Steele, D. The Chemistry of the Metallic Elements. Oxford: Pergamon Press. p. 67. ↑ Greenwood, N. N.; Earnshaw, A. Chemistry of the Elements (2nd ed.). Oxford: Elsevier Science Ltd. p. 1206. ISBN 978-0-7506-3365-9. ↑ MacKay, K. M.; MacKay, R. A.; Henderson, W. (2002). Introduction to Modern Inorganic Chemistry (6th ed.). Cheltenham: Nelson Thornes. pp. 194–196, 385. ISBN 978-0-7487-6420-4. ↑ Siegfried, R. (2002). From elements to atoms a history of chemical composition. Philadelphia, Pennsylvania: Library of Congress Cataloging-in-Publication Data. p. 92. ISBN 978-0-87169-924-4. ↑ Horvitz, L. (2002). Eureka! : Scientific Breakthroughs That Changed The World. New York: John Wiley. p. 43. ISBN 978-0-471-23341-1. OCLC 50766822. ↑ van Spronsen, J. W. (1969). The periodic system of chemical elements. Amsterdam: Elsevier. p. 19. ISBN 978-0-444-40776-4. ↑ "Alexandre-Emile Bélguier de Chancourtois (1820–1886)" (in French). Annales des Mines history page. Archived from the original on 27 November 2014. Retrieved 18 September 2014. ↑ Odling, W. (2002). "On the proportional numbers of the elements". Quarterly Journal of Science. 1: 642–648 (643). 1 2 Scerri, E. (2011). The periodic table: A very short introduction. Oxford: Oxford University Press. ISBN 978-0-19-958249-5. ↑ Kaji, M. (2004). "Discovery of the periodic law: Mendeleev and other researchers on element classification in the 1860s". In Rouvray, D. H.; King, R. Bruce. The periodic table: Into the 21st Century. Research Studies Press. pp. 91–122 (95). ISBN 978-0-86380-292-8. ↑ Newlands, J. A. R. (20 August 1864). "On Relations Among the Equivalents". Chemical News. 10: 94–95. Archived from the original on 1 January 2011. ↑ Newlands, J. A. R. (18 August 1865). "On the Law of Octaves". Chemical News. 12: 83. Archived from the original on 1 January 2011. ↑ Brock, W. H.; Knight, D. M. (1965). "The Atomic Debates: 'Memorable and Interesting Evenings in the Life of the Chemical Society'". Isis. 56 (1): 5–25. doi:10.1086/349922. ↑ Kauffman, G. B. (March 1969). "American forerunners of the periodic law". Journal of Chemical Education. 46 (3): 128–135 (132). Bibcode:1969JChEd..46..128K. doi:10.1021/ed046p128. ↑ Mendelejew, D. (1869). "Über die Beziehungen der Eigenschaften zu den Atomgewichten der Elemente". Zeitschrift für Chemie (in German): 405–406. ↑ Pullman, B. (1998). The Atom in the History of Human Thought. Translated by Axel Reisinger. Oxford University Press. p. 227. ISBN 978-0-19-515040-7. ↑ Atkins, P. W. (1995). The Periodic Kingdom. HarperCollins Publishers, Inc. p. 87. ISBN 978-0-465-07265-1. 1 2 Samanta, C.; Chowdhury, P. Roy; Basu, D. N. (2007). "Predictions of alpha decay half-lifes of heavy and superheavy elements". Nucl. Phys. A. 789 (1–4): 142–154. arXiv:nucl-th/0703086. Bibcode:2007NuPhA.789..142S. CiteSeerX 10.1.1.264.8177. doi:10.1016/j.nuclphysa.2007.04.001. 1 2 Briggs, Helen (2019-01-29). "Happy birthday, periodic table". Retrieved 2019-02-08. ↑ Kaji, M. (2002). "D. I. Mendeleev's Concept of Chemical Elements and the Principle of Chemistry" (PDF). Bull. Hist. Chem. 27 (1): 4–16. Archived (PDF) from the original on 6 July 2016. ↑ Adloff, J-P.; Kaufman, G. B. (25 September 2005). "Francium (Atomic Number 87), the Last Discovered Natural Element". The Chemical Educator. Archived from the original on 4 June 2013. Retrieved 26 March 2007. 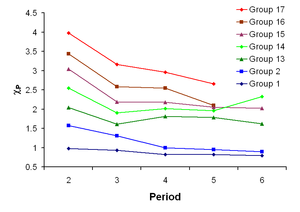 ↑ Abraham, M.; Coshow, D.; Fix, W. Periodicity:A source book module, version 1.0 (PDF). New York: Chemsource, Inc. p. 3. Archived from the original (PDF) on 14 May 2012. ↑ Emsley, J. (7 March 1985). "Mendeleyev's dream table". New Scientist: 32–36(36). ↑ Fluck, E. (1988). "New notations in the period table". Pure and Applied Chemistry. 60 (3): 431–436 (432). doi:10.1351/pac198860030431. ↑ Masterton, W. L.; Hurley, C. N.; Neth, E. J. (2011-01-31). Chemistry: Principles and reactions (7th ed.). Belmont, CA: Brooks/Cole Cengage Learning. p. 173. ISBN 978-1-111-42710-8. ↑ Эксперимент по синтезу 117-го элемента получает продолжение [Experiment on synthesis of the 117th element is to be continued] (in Russian). JINR. 2012. Archived from the original on 1 August 2013. ↑ Newell, S. B. (1980). Chemistry: An introduction. Boston: Little, Brown and Company. p. 196. ISBN 978-0-316-60455-0. Retrieved 27 August 2016. ↑ Jensen, W. B. (1982). "Classification, Symmetry and the Periodic Table". Computers & Mathematics with Applications. 12B (1/2): 487–510 (498). doi:10.1016/0898-1221(86)90167-7. ↑ Leach, M. R. (2012). "Concerning electronegativity as a basic elemental property and why the periodic table is usually represented in its medium form". Foundations of Chemistry. 15 (1): 13–29. doi:10.1007/s10698-012-9151-3. ↑ Thyssen, P.; Binnemans, K. (2011). Gschneidner Jr., K. A.; Bünzli, J-C.G; Vecharsky, Bünzli, eds. Accommodation of the Rare Earths in the Periodic Table: A Historical Analysis. Handbook on the Physics and Chemistry of Rare Earths. 41. Amsterdam: Elsevier. p. 76. ISBN 978-0-444-53590-0. ↑ Jensen, William B. (1986). "CLASSIFICATION, SYMMETRY AND THE PERIODIC TABLE" (PDF). Comp. & Maths. With Appls. 12B (I/2). Retrieved 18 January 2017. ↑ Finding Aid to Edward G. Mazurs Collection of Periodic Systems Images. Science History Institute. Click on 'Finding Aid' to go to full finding aid. ↑ "Weird Words of Science: Lemniscate Elemental Landscapes". Fields of Science. fieldofscience.com. 22 March 2009. Archived from the original on 4 March 2016. Retrieved 4 January 2016. ↑ Emsely, J.; Sharp, R. (21 June 2010). "The periodic table: Top of the charts". The Independent. Archived from the original on 1 July 2017. ↑ Seaborg, G. (1964). "Plutonium: The Ornery Element". Chemistry. 37 (6): 14. ↑ Mark R. Leach. "1925 Courtines' Periodic Classification". Archived from the original on 16 May 2016. Retrieved 16 October 2012. ↑ Mark R. Leach. "1949 Wringley's Lamina System". Archived from the original on 3 December 2011. Retrieved 16 October 2012. ↑ Mark R. Leach. "1996 Dufour's Periodic Tree". Archived from the original on 18 April 2010. Retrieved 16 October 2012. ↑ Mark R. Leach. "1989 Physicist's Periodic Table by Timothy Stowe". Archived from the original on 5 June 2012. Retrieved 16 October 2012. ↑ Bradley, D. (20 July 2011). "At last, a definitive periodic table?". ChemViews Magazine. doi:10.1002/chemv.201000107. Archived from the original on 1 May 2013. ↑ Mark R. Leach. "2002 Inorganic Chemist's Periodic Table". Archived from the original on 9 March 2013. Retrieved 16 October 2012. ↑ Scerri, E. (2008). "The role of triads in the evolution of the periodic table: Past and present". Journal of Chemical Education. 85 (4): 585–589 (589). Bibcode:2008JChEd..85..585S. doi:10.1021/ed085p585. ↑ Alper, R. (2010). "The simplified periodic table: elements ordered by their subshells". The Journal of Biological Physics and Chemistry. 10 (2): 74–80. doi:10.4024/43AL09F.jbpc.10.02. 1 2 Scerri, E. (2012). "Some comments on the recently proposed periodic table featuring elements ordered by their subshells". Journal of Biological Physics and Chemistry. 12 (2): 69–70. ↑ Bent, H. A.; Weinhold, F. (2007). "Supporting information: News from the periodic table: An introduction to "Periodicity symbols, tables, and models for higher-order valency and donor–acceptor kinships"". Journal of Chemical Education. 84 (7): 3–4. doi:10.1021/ed084p1145. ↑ Francl, M. (May 2009). "Table manners" (PDF). Nature Chemistry. 1 (2): 97–98. Bibcode:2009NatCh...1...97F. doi:10.1038/nchem.183. PMID 21378810. Archived (PDF) from the original on 25 October 2012. ↑ IUPAC (1 May 2013). "IUPAC Periodic Table of the Elements" (PDF). iupac.org. IUPAC. Archived from the original (PDF) on 22 August 2015. Retrieved 20 September 2015. ↑ Seaborg, G. (1945). "The chemical and radioactive properties of the heavy elements". Chemical English Newspaper. 23 (23): 2190–2193. doi:10.1021/cen-v023n023.p2190. ↑ Cronyn, M. W. (August 2003). "The Proper Place for Hydrogen in the Periodic Table". Journal of Chemical Education. 80 (8): 947–951. Bibcode:2003JChEd..80..947C. doi:10.1021/ed080p947. ↑ Lewars, Errol G. (5 December 2008). Modeling Marvels: Computational Anticipation of Novel Molecules. Springer Science & Business Media. pp. 69–71. ISBN 978-1-4020-6973-4. Archived from the original on 19 May 2016. ↑ Thyssen, P.; Binnemans, K. (2011). Gschneidner Jr., K. A.; Bünzli, J-C.G; Vecharsky, Bünzli, eds. Accommodation of the Rare Earths in the Periodic Table: A Historical Analysis. Handbook on the Physics and Chemistry of Rare Earths. 41. Amsterdam: Elsevier. pp. 1–94. ISBN 978-0-444-53590-0. ↑ Hevesy, G. (1929). Redkie zemeli s tochki zreniya stroeniya atoma [Rare earths from the point of view of structure of atom] (cited in Trifonov 1970, p. 188) (in Russian). Leningrad: NKhTI. ↑ Stewart, P. J. (2008). "The Flyleaf Table: An Alternative". Journal of Chemical Education. 85 (11): 1490. Bibcode:2008JChEd..85.1490S. doi:10.1021/ed085p1490. ↑ Thyssen, P.; Binnemanns, K. (2011). "1: Accommodation of the rare earths in the periodic table: A historical analysis". In Gschneidner Jr., K. A.; Büzli, J-C. J.; Pecharsky, V. K. Handbook on the Physics and Chemistry of Rare Earths. 41. Amsterdam: Elsevier. pp. 80–81. ISBN 978-0-444-53590-0. ↑ Keeler, J.; Wothers, P. (2014). Chemical Structure and Reactivity: An Integrated Approach. Oxford: Oxford University. p. 259. ISBN 978-0-19-960413-5. ↑ Scerri, E. (2012). "Mendeleev's Periodic Table Is Finally Completed and What To Do about Group 3?". Chemistry International. 34 (4). doi:10.1515/ci.2012.34.4.28. Archived from the original on 5 July 2017. ↑ Castelvecchi, D. (8 April 2015). "Exotic atom struggles to find its place in the periodic table". Nature. doi:10.1038/nature.2015.17275. Archived from the original on 5 October 2015. Retrieved 20 September 2015. ↑ "The constitution of group 3 of the periodic table". IUPAC. 2015. Archived from the original on 5 July 2016. Retrieved 30 July 2016. 1 2 3 4 5 6 7 William B. Jensen (1982). "The Positions of Lanthanum (Actinium) and Lutetium (Lawrencium) in the Periodic Table". J. Chem. Educ. 59 (8): 634–636. Bibcode:1982JChEd..59..634J. doi:10.1021/ed059p634. ↑ Trifonov, D. N. (1970). 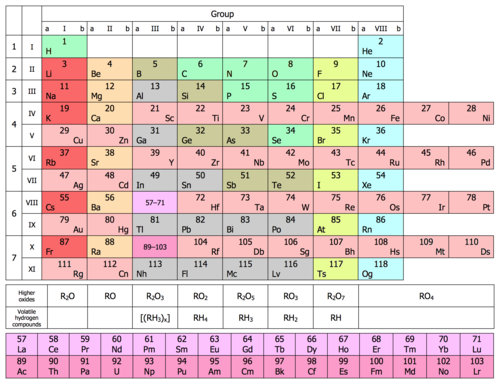 Rare-earth elements and their position in the periodic system (translated from Russian). New Delhi: Indian National Scientific Documentation Centre. pp. 201–202. ↑ Greenwood, N. N.; Harrington, T. J. (1973). The chemistry of the transition elements. Oxford: Clarendon Press. p. 50. ISBN 978-0-19-855435-6. ↑ Aylward, G.; Findlay, T. (2008). SI chemical data (6th ed.). Milton, Queensland: John Wiley & Sons. ISBN 978-0-470-81638-7. ↑ Wiberg, N. (2001). Inorganic Chemistry. San Diego: Academic Press. p. 119. ISBN 978-0-12-352651-9. ↑ Wulfsberg, G. (2006). "Periodic table: Trends in the properties of the elements". Encyclopedia of Inorganic Chemistry. New York: John Wiley & Sons. p. 3. ISBN 978-0-470-86210-0. 1 2 Cotton, S. (2007). Lanthanide and Actinide Chemistry. Chichester: John Wiley & Sons. p. 150. ISBN 978-0-470-01006-8. ↑ Jensen, W. B. (2015). "Some Comments on the Position of Lawrencium in the Periodic Table" (PDF). Archived from the original (PDF) on 23 December 2015. Retrieved 20 Sep 2015. ↑ Xu, W-H.; Pyykkö, P. (2016). "Is the chemistry of lawrencium peculiar?". Physical Chemistry Chemical Physics. 18 (26): 17351–17355. Bibcode:2016PCCP...1817351X. doi:10.1039/C6CP02706G. PMID 27314425. ↑ King, R. B. (1995). Inorganic Chemistry of Main Group Elements. New York: Wiley-VCH. p. 289. ISBN 978-1-56081-679-9. ↑ Leigh, G. J. (2009). "Periodic Tables and IUPAC". Chemistry International. 31 (1). Retrieved 27 November 2018. ↑ Xuefang, W.; Andrews, L.; Riedel, S.; Kaupp, M. (2007). "Mercury Is a Transition Metal: The First Experimental Evidence for HgF4". Angew. Chem. Int. Ed. 46 (44): 8371–8375. doi:10.1002/anie.200703710. PMID 17899620. 1 2 Jensen, W. B. (2008). "Is Mercury Now a Transition Element?". J. Chem. Educ. 85 (9): 1182–1183. Bibcode:2008JChEd..85.1182J. doi:10.1021/ed085p1182. ↑ Rayner-Canham, G.; Overton, T. (2006-01-01). Descriptive inorganic chemistry (4th ed.). New York: W H Freeman. pp. 484–485. ISBN 978-0-7167-8963-5. ↑ Schändel, M. (2003). The Chemistry of Superheavy Elements. Dordrecht: Kluwer Academic Publishers. p. 277. ISBN 978-1-4020-1250-1. ↑ Yakushev, Alexander; Eichler, Robert (2016). Gas-phase chemistry of element 114, flerovium (PDF). Nobel Symposium NS160 – Chemistry and Physics of Heavy and Superheavy Elements. doi:10.1051/epjconf/201613107003. ↑ Fricke, B.; Greiner, W.; Waber, J. T. (1971). "The continuation of the periodic table up to Z = 172. The chemistry of superheavy elements". Theoretica Chimica Acta. 21 (3): 235–260. doi:10.1007/BF01172015. ↑ Pyykkö, P. (2011). "A suggested periodic table up to Z ≤ 172, based on Dirac–Fock calculations on atoms and ions". Physical Chemistry Chemical Physics. 13 (1): 161–168. Bibcode:2011PCCP...13..161P. doi:10.1039/c0cp01575j. PMID 20967377. ↑ van der Schoor, K. (2016). Electronic structure of element 123 (PDF) (Thesis). Rijksuniversiteit Groningen. ↑ Elliot, Q. A. (1911). "A modification of the periodic table". Journal of the American Chemical Society. 33 (5): 684–688 (688). doi:10.1021/ja02218a004. ↑ Seaborg, G. (c. 2006). "transuranium element (chemical element)". Encyclopædia Britannica. Archived from the original on 30 November 2010. Retrieved 16 March 2010. ↑ Cwiok, S.; Heenen, P.-H.; Nazarewicz, W. (2005). "Shape coexistence and triaxiality in the superheavy nuclei". Nature. 433 (7027): 705–9. Bibcode:2005Natur.433..705C. doi:10.1038/nature03336. PMID 15716943. 1 2 Ball, P. (November 2010). "Would Element 137 Really Spell the End of the Periodic Table? Philip Ball Examines the Evidence". Chemistry World. Archived from the original on 21 October 2012. Retrieved 30 September 2012. ↑ Gambhir, Y.K; Bhagwat, A.; Gupta, M. (2015). "The highest limiting Z in the extended periodic table". Journal of Physics G: Nuclear and Particle Physics. 42 (12): 125105. doi:10.1088/0954-3899/42/12/125105. ↑ Eisberg, R.; Resnick, R. (1985). Quantum Physics of Atoms, Molecules, Solids, Nuclei and Particles. Wiley. ↑ Bjorken, J. D.; Drell, S. D. (1964). Relativistic Quantum Mechanics. McGraw-Hill. ↑ Greiner, W.; Schramm, S. (2008). "Resource Letter QEDV-1: The QED vacuum". American Journal of Physics. 76 (6): 509. Bibcode:2008AmJPh..76..509G. doi:10.1119/1.2820395. , and references therein. 1 2 Scerri, Eric (9 August 2013). "Is there an optimal periodic table and other bigger questions in the philosophy of science". ericscerri23.blogspot.com.au. Eric Scerri. Archived from the original on 13 June 2017. Retrieved 4 September 2013. ↑ Sella, Andrea (7 August 2013). "An elementary history lesson". New Scientist (2929). Archived from the original on 3 July 2016. Retrieved 13 June 2017.